Flash flooding occurred in the Barcelona area on 10th June 2000. The maximum rainfall was recorded on the Montserrat Mountain, with 224 mm recorded in less than 6 hours. The Vendrell area had a maximum of 134 mm falling in less than 3 hours. The intensity was such that a state of emergency was declared in El Vendrell. 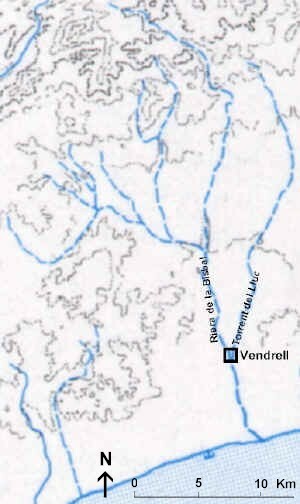 Vendrell lies at the confluence of two normally dry rieras (intermittent streams), the Riera de la Bisbal and the Torrent del Lluc. The confluence of these two rivers flows across a main road into the town. The Riera de la Bisbal had benefited from canalisation through the town, but the Torrent del Lluc remained as a natural channel, running at the same level as the main road in several locations. Flooding from the Lluc seriously affected dozens of homes and businesses in the town centre. A number of river management schemes have since been implemented along the Lluc to prevent a repetition of the disaster. These have had unexpected consequences. This river management case study forms part of a flash flooding investigation, with morning fieldwork normally undertaken at Riera de Ribes.